Truck Mounted, Rough-Terrain, Crawler, and Floating. A truck-mounted crane can be moved over highways and roads and is self-propelled. It has two main parts: the carrier, often referred to as the lower, and the superstructure which includes the boom and is referred to as the upper. These two parts are connected by a turntable, allowing the upper to swing from side to side. Current model hydraulic truck cranes are usually single-engine machines, with the same engine powering the super-structure and the carrier. 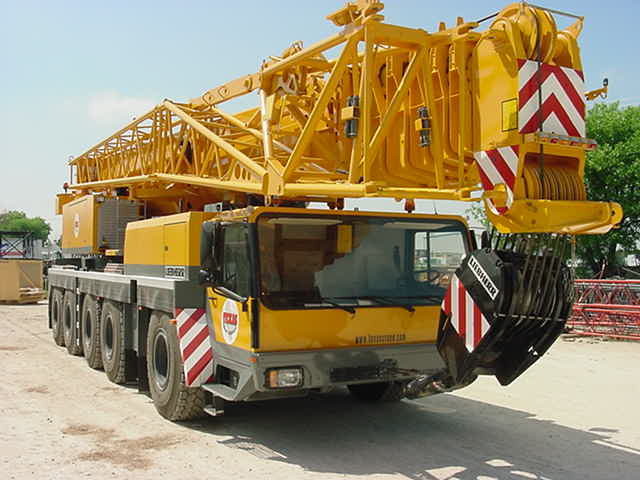 In some instance’s truck cranes can have an engine to power the lower and a second one to power the upper. In the case of a single engine truck crane the upper is powered by hydraulics that run through the turntable from the pump mounted on the lower. When two engines exist in a hydraulic truck crane the lower engine propels the crane down the road and runs a hydraulic pump for the outriggers. Outriggers, consisting of both horizontal and vertical beams are used to set up the crane for lifting purposes. The engine in the upper runs the upper through a hydraulic pump of its own. It is thought that Hiab invented the world's first hydraulic truck mounted crane in 1947. The name, Hiab, comes from the commonly used abbreviation of Hydrauliska Industri AB, a company founded in Hudiksvall, Sweden in 1944 by Eric Sundin. Sundin was a ski manufacturer who saw a way to utilize a truck's engine to power cranes through the use of hydraulics. 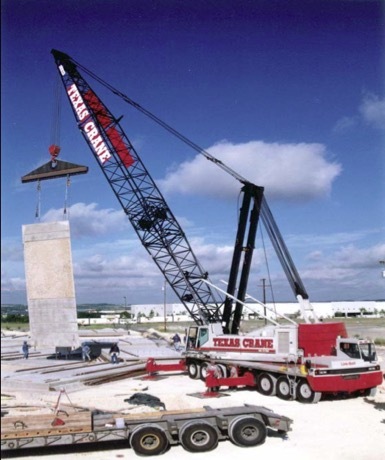 Truck cranes are able to travel on highways, eliminating the need for special equipment to transport the crane unless weight or dimension restrictions are in place via local laws. 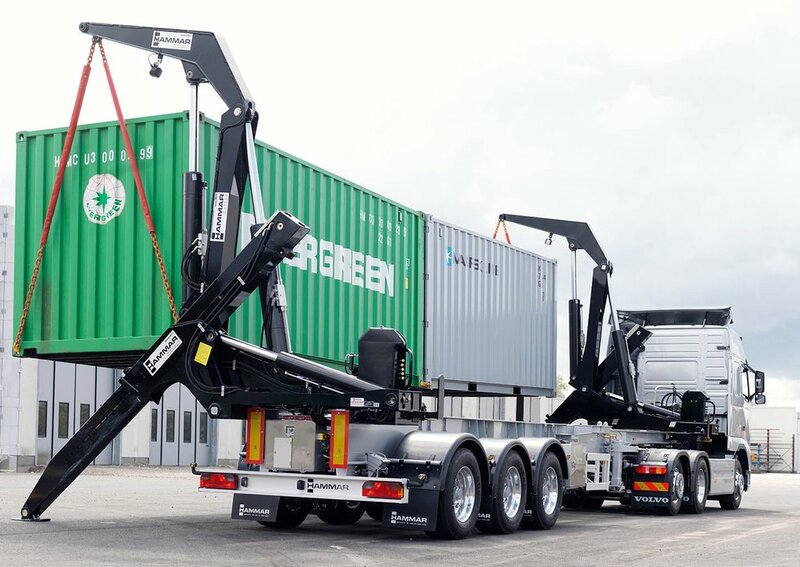 If excess weight and dimension laws are in place, larger cranes are equipped with either special trailers or dollies with extra axles to help spread the load over more axles or they are able to be disassembled to meet highway weight requirements. An example of pieces that can be disassembled for transportation purposes is counterweights. Often a crane will be followed by another truck hauling the counterweights that are removed for travel. In addition, some cranes are able to remove the entire upper. However, this is usually only an issue in a large crane and mostly done with conventional cranes such as a Link-Belt HC-278H (see below). When working on the job site, outriggers are extended horizontally from the chassis (lower) then vertically to level and stabilize the crane while stationary and hoisting. Many truck cranes have slow-travelling capability (a few miles per hour) while suspending a load. Great care must be taken not to swing the load sideways from the direction of travel, as most anti-tipping stability then lies in the stiffness of the chassis suspension. Some cranes of this type also have moving counterweights for stabilization beyond that provided by the outriggers. Loads suspended directly behind the crane carrier are the most stable, since most of the weight of the crane acts as a counterweight. Computerized factory-calculated charts are used by crane operators to determine the maximum safe loads for stationary (outrigger) work, lifting (onrubber) loads and crane travelling speeds. All of the latest generation cranes are equipped with fully computerized controls and many can be operated remotely via blue-tooth. Truck cranes range in lifting capacity from about 20 tons to many thousands of tons. These truck mounted cranes can rotate a full 360° degrees. A rough terrain crane has a boom mounted on an undercarriage that sits on top of four large rubber tires. This mobile crane is designed for off-road pick-and-carry operations. Outriggers are used to level and stabilize the crane for hoisting. These telescopic cranes are single-engine machines. 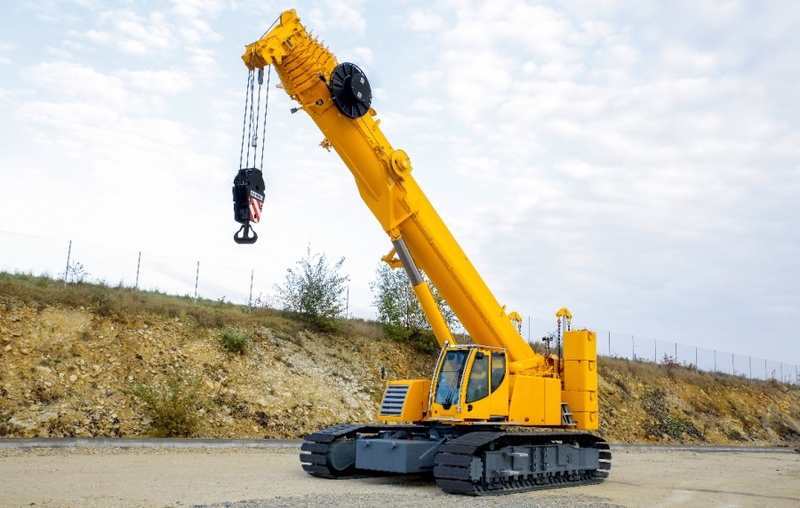 The same engine supplies power to the undercarriage and the crane, similar to a crawler crane. Unlike the crawler crane the engine is usually mounted in the undercarriage rather than in the upper. RT’s have 4-wheel drive and 4-wheel steering for traversing tighter areas and rougher terrain than a standard truck crane. A crawler crane has its boom mounted on an undercarriage fitted with a set of crawler tracks that provide both stability and mobility. Crawler cranes range in lifting capacity from about 40 to 3,500 tons. The main advantage of a crawler crane is its ready mobility and use, since the crane is able to operate on sites with minimal improvement and is stable on its tracks without outriggers. These wide tracks spread the weight out over a greater area and are far better than wheels at traversing soft ground without getting stuck. A crawler crane is also capable of traveling with a load. Its main disadvantage is its weight, making it difficult and expensive to transport. Typically, a large crawler must be disassembled at least into boom and cab and moved by trucks or rail cars to its next location. This type of crawler crane is used in much the same application as the conventional boom crawlers. However, because of its hydraulically telescoping boom it is more specialized in that it can lift and place loads in places where fixed conventional boom crawlers are not able to access or reach. This tele-crawler’s lifting capacities are less than the conventional crawler because of its heavier hydraulic boom. 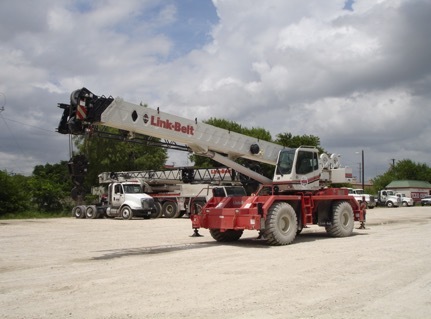 An all-terrain crane is a hybrid which combines the road-ability of a truck-mounted crane and the on-site maneuverability of a rough-terrain crane. The all-terrain has many of the same characteristics as the truck crane. It can travel at high speeds on public roads and maneuver on rough terrain job sites using its all-wheel crab and steering capabilities. AT’s typically have 2-9 axles and are designed for lifting loads from 40 tons up to hundreds of tons. A pick and carry or carry deck crane is similar to a mobile crane in that it is designed to travel on public roads; however, pick and carry cranes have no stabilizer legs or outriggers and are designed to lift the load and carry it to its destination, within close proximity, then be able to drive to the next job. Pick and carry cranes are popular in many countries where large distances are encountered on a particular job site. One popular manufacturer in Australia was Franna, which has since been bought by Terex, and now all pick and carry cranes in Australia are commonly referred to as "Frannas" or “carry decks” even though they may be made by other manufacturers. Nearly every medium and large sized crane manufacturer has at least one carry deck model and many have a full product line of these cranes. The capacity range is usually two to twenty tons of maximum lift capacity. Pick and carry cranes have displaced the work usually completed by smaller truck cranes as the set-up time is much quicker. The carry deck crane is a small 4-wheel crane with a 360° rotating boom placed right in the center of the carrier and an operators cab is located at the lower end this boom. The rear section of the carrier houses the engine and the area above the wheels is a flat deck. Very much an American invention the carry deck can hoist a load in a confined space and then load it on the deck space around the cab or engine and subsequently move to another site. The carry deck principle is the American version of the pick and carry crane and both allow the load to be moved by the crane over short distances. A tower crane is typically transported with trucks to large commercial or industrial job sites and erected using another mobile crane to assemble it. The long vertical lattice tower is set in place by using fixing angles and a large concrete poured slab at its base. The horizontal lattice piece is referred to as the jib and is lifted into place and attached to the top of the vertical lattice boom with an assist crane. The jib employs a counterweight system at one end to offset the loads that are lifted at its other end. Tower cranes are engineered to withstand high winds and the jib can be set to “weather vane” so as to avoid any structural integrity issues caused by high winds or weather. These cranes are engineered to be assembled in a specific order piece by piece. This system is designed to prevent the crane from becoming unbalanced and toppling over during assembly and disassembly. It is critical to conduct this procedure correctly to avoid catastrophic failures during assembly, disassembly and while in use. Most Tower Cranes are put into place and used for extended periods (months) at a time. A sidelifter crane is an over the road truck or semi-trailer, able to hoist and transport ISO standard containers. Container lifts are done with parallel crane-like hoists, which can lift a container from the ground or from a railway vehicle. A telescopic handler, also called a telehandler or teleporter, is a machine widely used in agriculture and industry. 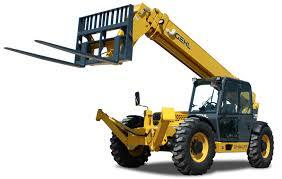 It is similar to a forklift but has a boom with telescopic cylinders making it more a crane than a forklift. It has the increased versatility of a single telescopic or articulating boom that can extend forward and upwards from the carrier. On the end of the boom the operator can connect one of several attachments, such as a bucket, pallet forks, or winch. Telescopic handlers are like forklift trucks that have a telescoping extendable boom like a crane. Early telescopic handlers only lifted in one direction and did not rotate. However, several manufacturers have designed telescopic handlers that rotate 360 degrees by using a turntable. These machines look a lot like the Rough Terrain Crane. The 360-degree telescopic handler/crane models have outriggers for stabilization that must be lowered before lifting. Their design has been simplified so that they can be quickly deployed. These machines are often used to handle pallets of bricks and install frame trusses on new building sites. In many instances they have replaced small telescopic truck cranes. Many of the world's armed forces have purchased telescopic handlers and some of these are the much more expensive fully rotating types. Their off-road capability and their on-site versatility to unload pallets using forks or lifting loads like a crane make them a valuable piece of machinery. Gantry, straddle or container cranes are used in shipping port facilities or inland water ways. A gantry crane is a crane built atop a gantry, which is a structure used to straddle an object or workspace. Gantry cranes for marine application are imposing, multi-story structures prominent at most container terminals and are used to load intermodal containers on and off container ships. They can range from enormous "full" gantry cranes, capable of lifting some of the heaviest loads in the world, to small shop cranes, used for tasks such as lifting automobile engines out of vehicles. A railroad crane has flanged wheels similar to train wheels for use on railroad tracks. The simplest form is a crane mounted on a flatcar. More capable devices are purpose-built. Different types of this mobile crane are used for maintenance work, recovery operations and freight loading in rail yards and scrap handling facilities. Aerial crane or 'Sky cranes' usually are helicopters designed to lift large loads. Helicopters are able to travel to and lift in areas that are difficult to reach by conventional cranes. Helicopter cranes are most commonly used to lift units/loads onto tall buildings and high-rises. They can lift anything within their lifting capacity, (cars, trailers, HVAC rooftop units, etc.). They are used in disaster relief for evacuations, clean-up, and to aid in extinguishing wild-fires by air lifting large amounts of water and flame-retardant chemicals to extinguish the fires. definitions and terminology used in the crane industry.